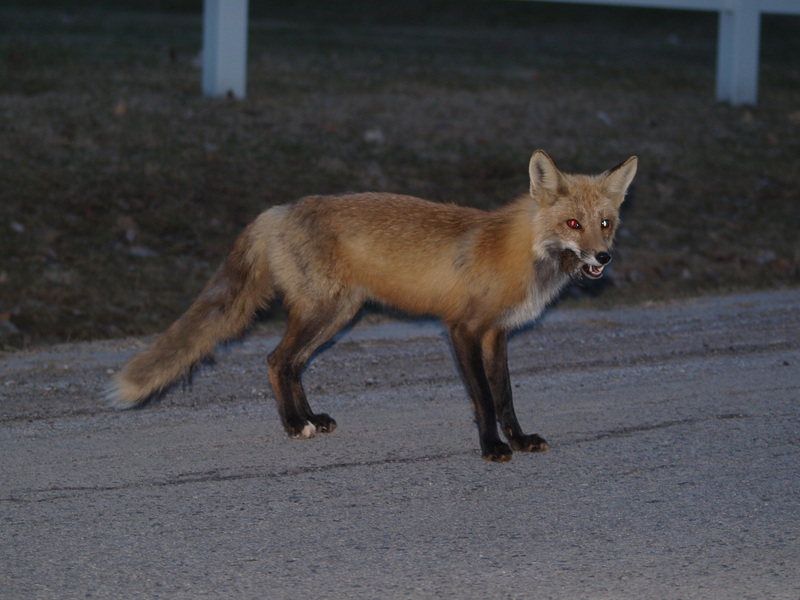 Here is a wild red fox I saw on the way home from work at Mt Pleasant & Castledurg. He had a mouse in his mouth and was walking along Mt. Pleasant for a long while, I followed him for about 1-2 km. I didn't think I would be able to get a good shot of him as its kind of hard to operate a camera and car at the time but luckily he stopped for a brief moment as we got closer to Castledurg and I was able to snap the above picture. I didn't even know he had a mouse in his mouth until I loaded the picture up on my computer. The Red Fox (Vulpes vulpes) is a mammal of the order Carnivora. It has the widest range of any terrestrial carnivore being native to Canada, Alaska, almost all of the contiguous United States, Europe, North Africa and almost all of Asia, including Japan. For more info on Red Fox's click here. Posted: May 10th, 2009 under Caledon, Photos, Wildlife. NICE PIC…….took one in fall hunting season. VERY BIG.. 18 lbs. I to know how hard it is to get one to stand still and feel it is sometimes harder to get a good pic rather than a clean shot. WELL DONE.